We often use our ‘sport’ or ‘hobby’ as a way to keep us fit, which is brilliant and can provide the motivation to get out for some exercise. But how about using some training off the bike to make your performance on the bike even better?! 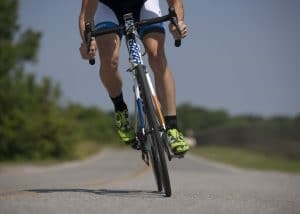 This simple exercise not only helps with your balance on the bike but gives you the upper hand in overall strength and endurance. The easiest way to get into the front plank is to start by lying on your front, lift up onto your elbows keeping your shoulders and elbows in line. Keep the forearms on the floor and your hands down on the mat. Lift your hips and knees off the floor and rest on your toes. It’s important to stay in a long straight position without raising your glutes up. Keep your glutes and thighs squeezed and tight and avoid arching through the back and shoulders. Keep your nose pointing towards the floor. Hold this for 40 – 60 seconds. If you struggle at first you can build it up in increments. Try 20 seconds plank and 20 seconds rest, 4 times, slowly building up to a continuous hold. Working your core and lower back, this tough exercise really builds strength for those long rides where the lower back can really start to feel the strain. Sit on the floor with your legs bent at a 45 degree angle and the feet flat on the floor in front. Place your palms flat on the floor by your side and slowly lift your feet off the floor. Lean back to create a ‘V’ shape with your body and pull your stomach in towards your spine. You can straighten out the legs a little to increase the tension. You can also lift your hands off the floor and hold these out towards your legs to work a little harder. Hold this pose for 15 seconds, rest for 10 seconds, 8 to 10 times round. Keeping those hamstrings, glutes and quads strong for the bike is important for endurance and the simple action of cycling. You do need some equipment for this exercise, something secure to step onto around 6 inches in height and some weights. If you don’t have dumbells, fill up some bottles of water or have a look around the kitchen cupboards, just make sure they are of equal weight. Holding a weight in each hand, step up onto the step, put the whole foot on the step, drive through thinking of pushing up using your glutes and hamstrings, activating your quads. Pause at the top with the trailing leg off the floor and repeat the exercise without returning your foot to the floor. Complete 12 repetitions on each leg, 2 – 3 times. The hamstrings are really important in the pulling action on the pedals so it’s good to build up your strength here. Lie on the floor with your knees bent at around 45 degrees and your feet flat. Keeping your head down and your shoulders connected to the floor raise up through your hips bringing your body in one continuous line from knees down to your neck. Squeeze your glutes and hamstrings and pause at the top of the movement. Return to the start but do not put your glutes on the floor, raise back up and continue on. Try for 10-12 repetitions and 3 sets. If you want to make this exercise harder, you can raise one leg straight into the air and complete the set on one side and then the other. Place the barbell across your shoulders (it’s good to get some help with this for safety) and your hands half way between your shoulders and the end of the barbell with palms facing forward. Stand with your feet comfortably around hip to shoulder width apart and feet at a 45 degree angle. Bend at the knee and hip until the thighs are almost parallel to the floor. Do not lift the heels up at any stage and in fact think about transferring weight a little into the heels. When you return to standing, ensure you do not lock out your knees. Squeeze your hips and glutes forward a little at the top of the squat and pause there. Go for 10-12 repetitions for 3 sets. The weight should be heavy enough that your last few repetitions on the last set are hard to complete. If you do not have access to a barbell, you can also just use your body weight. Skipping is a great way to get in some high intensity cardio training whilst strengthening up and building endurance in the calf muscles and shoulders. 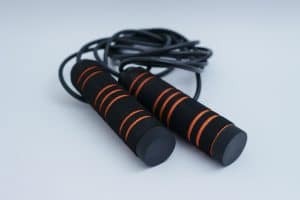 You can really get your heart racing and improve your cycling fitness with skipping. Start with 45 seconds on and 30 seconds break 3 times over and build this up to 60 seconds work and 30 seconds break 3 times over. You don’t need to jump really high, just enough to clear the rope. Try not to swing your arms around in circles and spin the rope using mainly your wrists. Stand up nice a tall, pulling in your abs to your back and drawing up through your head. Ensure your shoulders are back and down and jump on your toes. Please note, these exercises are suggestions and we advise you to seek professional help with regards to a specific training programme that suits you. Ensuring you have correct form is vital so as not to injure yourself during any of the exercises. If in doubt, seek advice!! 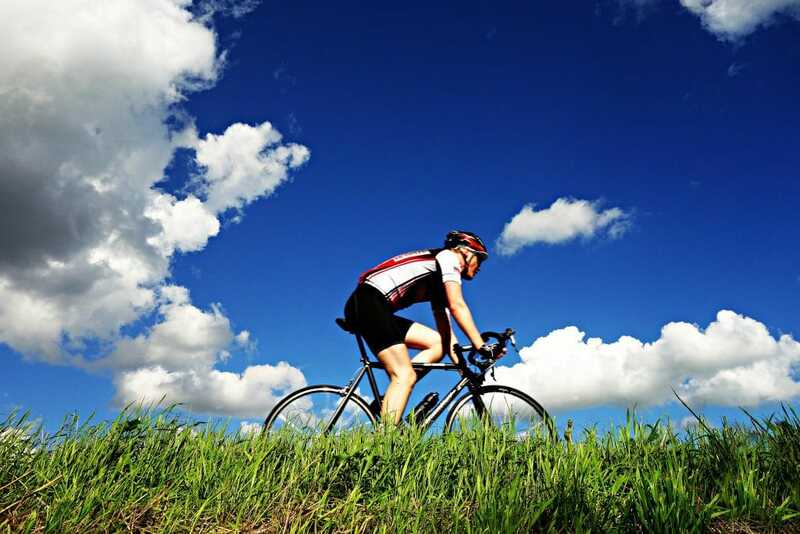 You can of course find some very specific programmes to improve certain aspects of your riding but in general, strengthening up your legs, abs and back is going to help you on those long climbs! It’s also a good idea to have a goal when you start to exercise so why not take a look at some of our tours coming up this summer! Knowing you have those Cols to climb will help whip you into shape for the bike. Get in contact to find out more or to discuss a bespoke trip designed just for you.